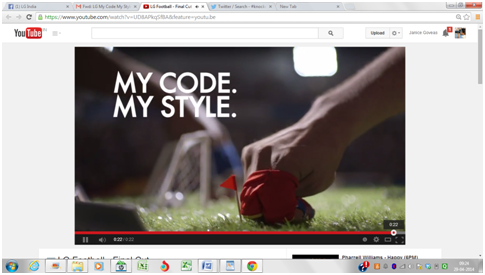 A very clever execution of a concept is what struck me when I saw the LG India #Knockcode video. Since, I am not exactly a thorough-bred technophile, the campaign did not reach me via my social media timeline, and therefore I am probably not the direct target audience. What struck me though was the execution of the idea into the Vine and Youtube videos that literally drove home the point of the product offering. 2. Call to action to adopt ‘a new habit’. This is essentially to buy the phone and use the security feature which is fool proof. The social media campaign chosen to engage with the target customer is bang on. Nothing explains better than a cleverly done video, cute enough to go viral on Facebook and Twitter. For a moment the video gave me a fleeting flashback of the finger-play by Fastrack, but I quickly came back to speed when I realised that the video was trying to tell me. LG’s smart execution of the concept through a video, involves the bringing to life of five interesting (finger) characters, namely, the Footballer, the Kickboxer, the Fashionista, the Unstoppable and the Dancer. 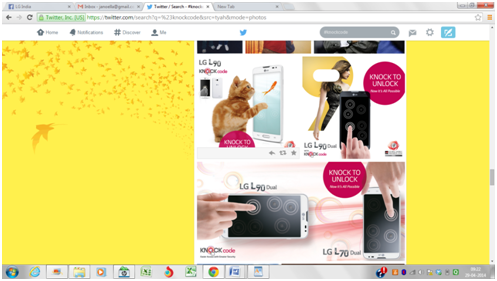 The first phase of LG’s digital campaign focussed on individual’s MyCodeMyStyle and #KnockCode as a teaser. In the second phase of the campaign, a ‘2 videos per day’ contest was launched for the users, wherein there will be a set of two videos created for each of the characters. These videos were then to be seeded on Facebook and Twitter, to position the #KnockCode feature. Each (finger) character was followed by a corresponding Twitter and Facebook wave. For example to go with the Fashionista character (yet to be promoted on twitter and FB by LG), all fashion conscious participants need to come up with their own fashion statement with #KnockCode. Participants on Facebook will talk about their flair for fashion with their MyCodeMyStyle and also mention a ‘fashionista’ friend, tagging them with #KnockCode. On twitter, participants will search for the most fashionable person amongst themselves and also mention a fashionable friend with #KnockCode. Participants will find out the Diva of Style on their timeline of friends and mention their Style Icon friend with #KnockCode and stand a chance to win LG’s KitKat OS based L90 or L70. The video very deftly drove home the point that different patterns can create different codes which are unique to each user. Since the phone screen shows no detectable outline of the pattern and so the code is virtually impossible to duplicate and there could be upto 80,000 unique codes! Take for example the dancing video. The way one danced is unique for different users. 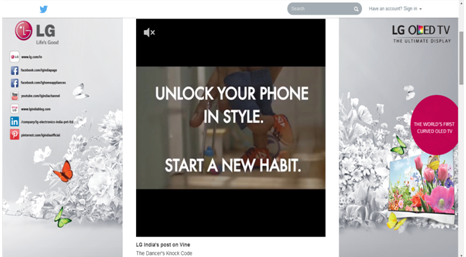 And the tagline of unlocking your phone is style and asking you to adopt a new habit are two calls to action, which fit perfectly with what the product proposition is. The twitter waves started by phase 1 (which started on April 15 with the football and dancer characters) have been encouraging. People are actively using #knockcode and responding favorably considering they are vying for winning the L90 or L70 model of the phone. Another good part of the campaign is that #knockcode transcends across markets and the implementation across was uniform. So you had @LGIndia, doing the same things as @LG_Thailand and @LGCanada, which I personally think is commendable. The company brief also says that the campaign has a Facebook element, it seems to be missing on their page, save for a single mention of the Knockcode phone and its features. Even the teaser video has not made an appearance on the company’s Facebook page. Youtube, where the original videos of the campaign are loaded hardly has any views. This is also probably because the campaign has just begun recently. The videos are interesting and can invite a lot of traction if promoted on through platforms effectively. Seamless integration of the campaign on the selected platforms is very essential for a successful and noticeable campaign, to get the results the company desires. Having said that, knowing LG India as a company, and the aggression they show in marketing and the waves this social media campaign has made in the international markets, I hope that this campaign will pick up steam and run quite successfully to make the impact it has set out to make. Can Social Media Help the Kundu Family Conserve Sunderban Tigers?